Chandigarh 31st October: Abhimanyu's IAS study group's Students have successfully cleared HCS. Haryana Civil Services final result declared on 28th October 2013, Sudhanshu Gautam, Shilpi Pattar, Ekta Chopra, Mamta Sharma and Rohit Yadav of the premier institute have also made their position in top 10 ranks. Ruchi Singh Gagandeep Singh, Amit Panchal, Jitender Singh, Devinder Kaler, Sarthak, Garima, Narinder Dhanda, Joginder Sharma and Rajbeer Kaur also made it to the HCS. Chandigarh 31st October: --- Indian Red Cross Society, Punjab State Branch today distributed walkers, blankets and medicines to the poor patients and fruits to the indoor patients of P.G.I as part of Diwali celebrations. Lady social workers of Punjab Red Cross distributed 500 packets of fruits to the admitted patients of Gastroenterology, Advanced Urology Centre, Male Surgical Ward, Gynae Ward, ICU & E.N.T. wards. Chandigarh 31st October: --- CRB Public School, Sector 7 Chandigarh today organised Rangoli Making Competition for the students of School. The theme for the competitions Diwali. The competition began with paying homage to goddess Lakshmi,the goddess of wealth and prosperity. On this occasion students also took a pledge to celebrate Diwali as a "Green- Diwali" and "say no to the Crackers." The winners of the competitions were applauded with Prizes & greetings by the Director and the Principal. A Plethora of activities and house wise competition followed in every class from Rangoli Making to card making, Diya Decorations, Candle Decorations and so on. The Director Naveen Mittal and Principal Mrs. Sangeeta Mittal give the brief details of the auspicious festival to the students. They said that the day has its historical importance because Lord Rama, Mata Sita & Lakshman returned to Ayodhya after 14 years of exile. To inculcate virtues depicted by Lord Rama among students and to find them their culture roots, this festival is celebrated with great pomp & show,in the school every year. The school is eco-friendly & environment conscious too. 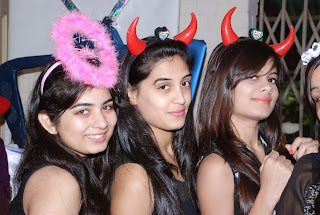 Chandigarh 31st October: --- Giving an impetus to the festive fervor, the Student Council of MCM DAV College for Women, Chandigarh organized a Diwali Mela at the college campus. The extravaganza upped the fun and frolic of the pious festival as a huge number of girls flooded the stalls put up at the mela. 9780 Artistic display of adorned dias and candles, artistic glass paintings, designer mirrors, interactive games, flowers and gifts, mehndi application and click and share counters, the mela had it all. Overwhelming rush of students and teachers alike enlivened the exceptional Diwali celebrations at MCM. The Principal of the college, Dr. Puneet Bedi was all praises for the endeavor and said that such events are a major leap in bringing the students close to our culture and imbibing in them culture and our virtuous traditional values. Chandigarh 31st October: --- Max Super Speciality Hospital, Mohali gave a new life to Partially deaf by birth, 18-year old Asif Wani of Srinagar. The surgery that done by the hospital not only saved the life of this innocent teenager but also complex from the medical point of view. The sixth child of a daily laborer, Abdul Azeea Wani, Asif was brought to Max Super Speciality Hospital, Mohali with complaints of breathlessness and palpitation. He was diagnosed with complex birth heart defects multiple conditions of Atrial septal defect, PDA and severe Pulmonary Stenosis (Congenital disorder) comprising of hole in the upper chambers of the heart, along with a flowing channel between main artery of the body and artery feeding the lungs which normally closes soon after birth. Max India Foundation took up the case and Asif was successfully operated upon by Dr. Virendar Sarwal, Principal Consultant and Chief of Dept. of Cardiothoracic and Vascular Surgery, Max Super Speciality Hospital Mohali. The 5-hour surgery involved one week of post operative care under expert supervision of critical care experts. While giving more detail about the such of the rare case Dr. Sarwal said that since these were birth defects, these were high risk surgeries. Asif lungs had developed early hypertensive changes and it was a long on pump surgery because of three congenital defects. His pulmonary valve was too small for his age. Asif underwent intracardiac repair on Cardiopulmonary bypass at Max Super Speciality Hospital on October 14 and soon recuperated. He would be requiring regular medication to support his heart condition. Dr. Ashutosh Sood, GM operations at Max Super Speciality Hospital Mohali said that this whole package bearing cost of Rs 2 lacs, was done entirely free of cost. However, it was well worth it because today Asif presented a heart warming sight. Having recovered very well, he was up and about, talking and playing like a normal teenager.. The joy on his face was priceless and nothing compared to the satisfaction of having helped tears turn into smiles, remarked Dr Sood. He further said that since Asif belonged to a poor family and his parents could not afford the expensive treatment, an acquaintance, who had been helping the family since last 2 years in arranging funds, approached Max India Foundation for financial assistance. Max India Foundation decided to help the young boy by bearing the entire cost of surgery and offering him world class medical treatment at Max Super Speciality Hospital. Ever since Abdul Azeea Wani, Asi's father lost his eyesight 5-6 years back, Asif's mother has been working as a labourer on a meager daily wage with no other source of income. The fellow villagers managed to gather Rs 16000 for the travel and stay once for the family for the further treatment. Chandigarh 30th October: ---It was decided by the members of the Sanitation committee of Municipal Corporation in the meeting of that sanitation system should be strengthened by providing all the material required by the safai karmacharies for sweeping. They were of the view that regular checking of safai karmacharies will be conducted by the councillors and officers of MC. Sanitation committee meeting was held today under the Chairmanship of H.C. Kalyan and attended by Satish Kainth, Deputy Mayor, M.P. Kohli, Babu Lal, Prof. Aruna Goyal, Satinder Singh, Saurabh Joshi, Dr. B.K. Salwan, Medical Officer of Health and concerned senior officers of Municipal Corporation. During the meeting the councilors also decided that awareness campaigns in colleges, schools, colonies, markets and sectors will be conducted to educate the inhabitants towards sanitation measures by organizing small functions. Chandigarh 30th October: --- Drug Deaddiction and Treatment Center, Department of Psychiatry, PGI, in collaboration with the NGO IBADAT today organized a drug deaddiction and awareness camp in Kurali. The team from the Drug Deaddiction Centre comprised of two Social Workers, one Senior Resident, two Junior Residents, one nursing staff and two MSc nursing students.During the camp almost 20 cases were seen. Patients were using alcohol, opioid and tobacco in almost equal frequencies. Members from Alcoholic Anonymous were also present for sensitizing the patient and family members towards problems of substance use. Cases were counselled and drugs for seven days were prescribed and dispensed free of cost. They were advised to visit again either to Drug Deaddiction and Treatment Centre at PGIMER (Monday to Saturday) or Kharar Civil Hospital (Saturday), whichever is near to their place. Families of patients attending camp were of the view that more such camps required in the village in future. Centre lauded their efforts and was ready for any such future collaborative endeavors. Mohali 30th October: ------ Lawerance Public School,Mohali excelled in District Athletic meet held at Mohali. Apart from getting 3 first positions, 22 medals were won by the students of lawrence School. In this athletic meet Baljit Kaur 14 years & Harman Deep Kaur 17 years got first in discus throw, While Jaspreet Kaur 17 Javelin throw got first, Jaskiran first in Hammer throw, Harroop Kaur third in high jump. In Boys category Simar Singh first in hammer throw & discus trow, Navrohi Singh first in 400 m race. Besides that Vishnu second in long jum & 200 m race, Jalaj Sharma first in 17 category hammer throw, Navjot Singh stood first in 17 discus throw,Uday Modgill second in discus throw ,200 m race, triple jump. While Jaspreet jassi got first in 100 m & 200 m race, Gursawak Singh 19 get second place in 200 m race. Besides that Sukhjot Singh, Gursewak Singh ,Jaspreet Jassi & Sandeep Jassi selected for state lavel games. Same as Uday Modgill, Yuvraj sava & Tejveer got first position in 4X100 relay race. This competition was according to age as there were different groups under the age of 14, 16, 18 and 20 to compete. Principal , Mrs Veena Malhotra while applauding coaches Ram Sanker ,Malkiat singh & the winners said that Lawrence school always stressed on the overall development of the children, so that, its students can mark their presence and can outshine in their interested sector. Chandigarh 28th October: --- KPMG in India launched its nationwide initiative aimed at environmental sustainability today at Saint John's High School in Chandigarh. Environmental sustainability is the need of the hour and is one of KPMG's key focus areas for their Citizenship initiatives. To celebrate twenty years of KPMG in India and keeping with their endeavor of working towards a sustainable future, a number of environment projects (solar and rainwater harvesting projects) will be inaugurated across ten locations in India at various schools, colleges and NGOs. KPMG believes in the idea of sustainable development and its long term and holistic impact on the future of energy and water conservation. In addition, KPMG also hopes to raise environmental awareness and a feeling of collective responsibility amongst the student community.In Chandigarh, the inauguration of the environment project was done by Atul Gandhi, Partner, KPMG in India. Through the project inaugurated, KPMG has provided Saint John's High School with solar street lights of 75Wp SPV. Atul Gandhi, Partner, KPMG in India said that KPMG recognizes the importance of educating students at schools and colleges about the crucial need of conserving our natural resources. In consonance with this belief, we aim to make a sustainable difference in our communities and are focused on building capacity for individuals and institutions. We are passionate about supporting the communities in which we live and work, and will remain committed to this practice. KPMG's Corporate Citizenship initiatives are aligned with the Millennium Development Goals under the key areas of Education, Environment and Development and focus on national development issues.